Updated: July 10, 5:43 a.m. | Posted: July 9, 11 p.m. 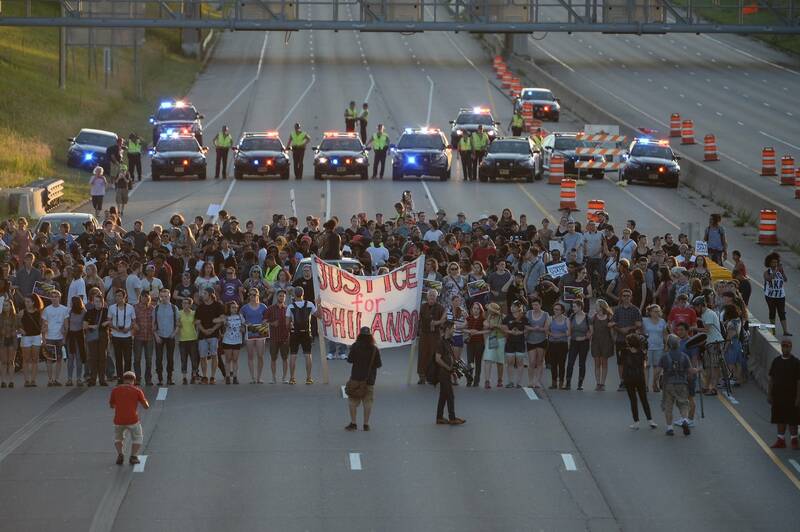 Rallies for racial justice enveloped the Twin Cities on Saturday, with protesters shutting down Interstate 94 in both directions for several hours that night, resulting in a tense standoff with police. 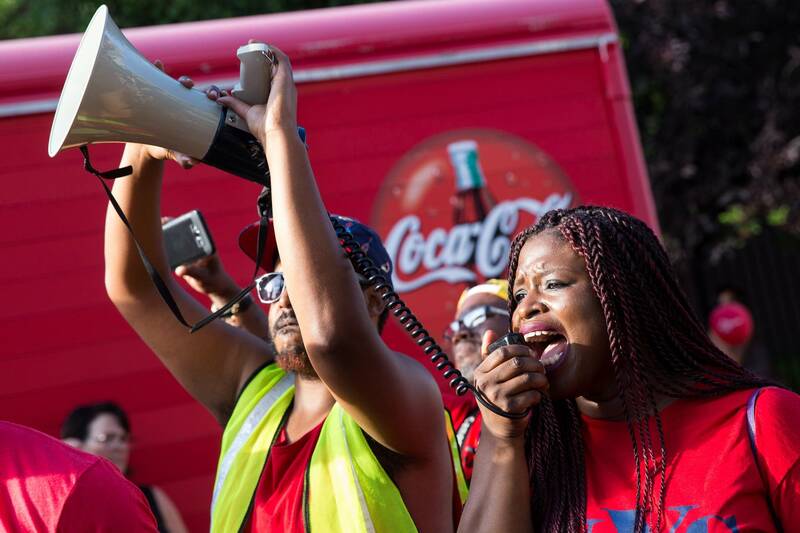 The rallies came after a week filled with violence, including the police killing of Philando Castile at a traffic stop in Falcon Heights, and a drive-by shooting in north Minneapolis that claimed the life of a 2-year-old boy and put a 15-month-old girl in the hospital. And outside Minnesota, there was the police killing of Alton Sterling in Louisiana and the slaying of five police officers in Dallas at a protest. In the protest that shut down I-94, there were multiple arrests of protesters and police said at least five officers were hurt, none seriously. 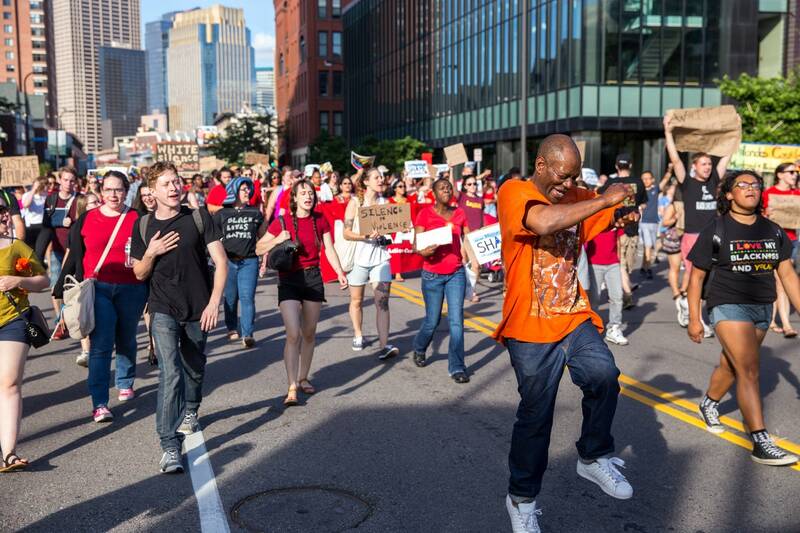 The events started in the late afternoon with a gathering in Minneapolis' Loring Park. Protesters wore red shirts, meant to signify the blood that been shed this week. Organizers billed the event as a march and rally focused on atoning for "our silence and indifference." Minneapolis NAACP President Nekima Levy-Pounds spoke to the group before they marched onto the main thoroughfare of Hennepin Avenue. She told the crowd that enough is enough. "I'm tired of people feeling unsafe in their own community," she said to the hundreds of people assembled. "There's a way to do policing in a more humane fashion. But right now we're at a place where just about anything goes." School social worker Ed Morales was at the rally with his daughter. Most of the kids he works with have lost family members to violence, he said, and he fears for their safety. He added that he is concerned about his own family as well. "My daughter is also a young black woman and I worry about her safety," Morales said. "She lives in a world that's unkind to her future, that's unkind to her dreams, that's unkind to her health and safety, and it's important as folks who are white that we stand up and start changing hearts and minds, because white silence is white violence." Protesters marched through downtown, eventually making their way to the entrance of the Basilica Block Party music festival. There police barred the protesters from entering. Even so, activist Jason Sole said the protest was a success. "Sometimes we have to go to white spaces and say 'Hey, think about our lives, because while you're partying, they're killing us out here. We're dying and I want to be a father to my children, so I want to live.' "
Just as the rally in Minneapolis was drawing to a close, another one was getting underway at the governor's residence on Summit Avenue in St. Paul, which has been a protester basecamp of sorts since the shooting Wednesday night. There, Black Lives Matter activist Mica Grimm counseled followers to film everything, saying that the dynamics of protests have changed dramatically in the past year. "We know that we're at risk just by showing up," she said. "And that's why it is so brave, so courageous, and we're about to make some noise today." Grimm stood in the back of a truck equipped with a sound system, leading approximately 500 people up Lexington Avenue. The truck hopped a median at Lexington Avenue and I-94, bypassing the State Patrol squad cars that were blocking the ramp down to the highway. 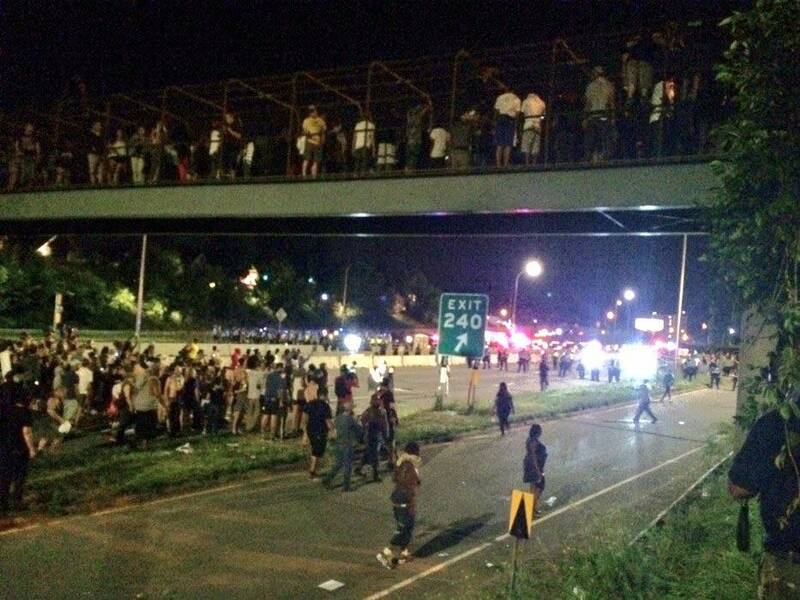 Both directions of the busy interstate were blocked as the crowd headed east, eventually pausing near the Dale Street exit. There the situation grew tense, as protesters faced off with cops, and began preparing themselves to be maced or arrested. By about 9:15 p.m., it was a tense situation on the highway and some protesters were handing out masks in anticipation of tear gas or pepper spray. Just before 10 p.m., a series of loud explosions erupted, and green smoke and gas filled the air. Police fired chemical irritants at the crowd and threatened at least 16 times to begin arresting those who stayed on the freeway. 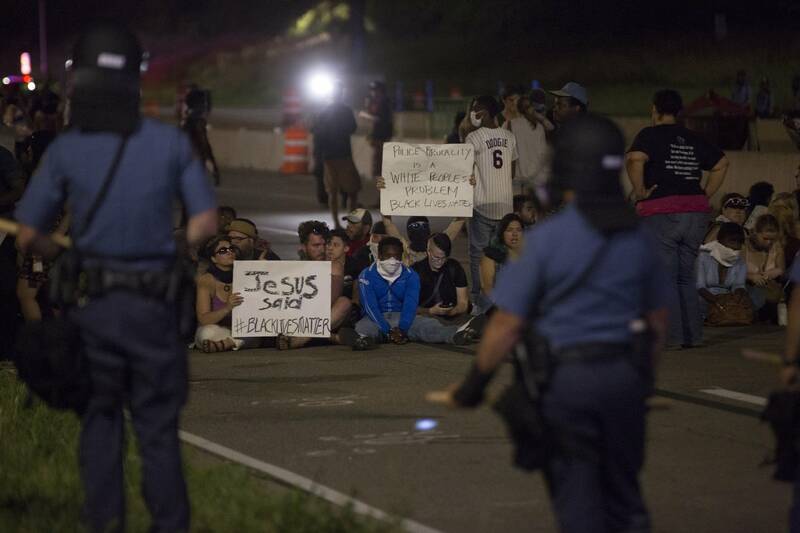 At 10 p.m. via Twitter, the St. Paul police said they were negotiating to make "symbolic arrests." As of early Sunday, no arrest count was available. Dozens of other people lined a pedestrian and banks of the interstate, at times clearing up the bank after flash bangs or chemical irritants. Nearly all the protesters were peaceful, save for some who threw water bottles and rocks at police or lit fireworks. St. Paul police said early Sunday that of the at least five officers who were injured, none were seriously hurt. Most protesters near the highway had cleared out by 12:20 a.m., and many went back to the governor's mansion where the march had started hours earlier. There, the scene was much more subdued with people listening to speakers and chatting. Leaders said their plan was to camp out through the night. At about 2 a.m., a few dozen protesters left the governor's mansion and marched down Grand Avenue chanting, "We're just taking a walk."